The Locanda Vivaldi is a historic property situated at only 5 minutes walk from Piazza San Marco, now carefully transformed into a small charming hotel. The hotel has a private pier for mooring boats and taxis, while the vaporetto stop of San Zaccaria is at just few meters. The hotel has a beautiful rooftop terrace that during the summer hosts the restaurant "Prete Rosso" exclusively for hotel Guests and offers a rich selection of seafood recipes, accompanied by an excellent selection of wines. During the day the terrace hosts a bar, so that Guests can enjoy the beautiful panorama on San Marco basin. 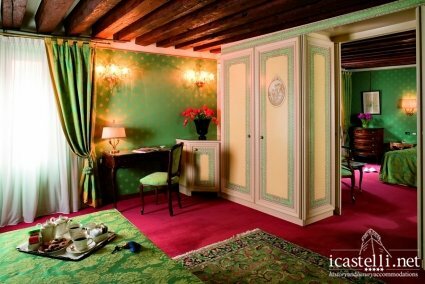 All rooms are furnished in the typical Venetian style just like the ancient tradition : marble, stucco, antique furniture, fine fabrics, carpets, drapes and warm lighting, blown glass from Murano, thus enriching the exclusive and intimate hotel atmosphere.